Flores taking the 5th...27 times. In 1996, Paul Flores walked Kristin Smart home from an off-campus college party to her dorm on the campus of CalPoly in San Luis Obispo, Ca. He was the last person seen with Kristin before she vanished. Kristin has never been found. Keep THis Ad Running on Facebook. Shop on amazon. Click the Amazon banner below. You'll link over to Amazon's homepage. Buy something for yourself. Anything you want. We'll earn an affiliate commission and we'll use those commissions to purchase more Facebook ads. We can buy roughly 1,000 ads for $2.00 so it adds up quick. When you buy something for yourself on Amazon, it helps more people see this ridiculous video. 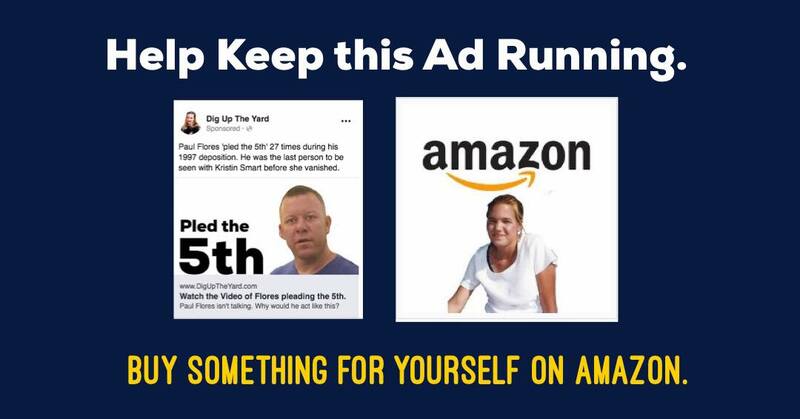 All ads will run within a 20-mile radius of Arroyo Grande, Ca.